As a seamstress, one of the coolest parts about knowing how to sew is taking an image of inspiration and transforming it into something for my closet. I can build my perfect wardrobe in the perfect fit and have a ton of fun in the process. This dress was over a year in the making. I saw this photo online, a close up of a dress and immediately wanted to make it. I started searching for map fabric and couldn’t find a decent print as many were super blue or it wasn’t a map print that was attractive. So I stopped searching. 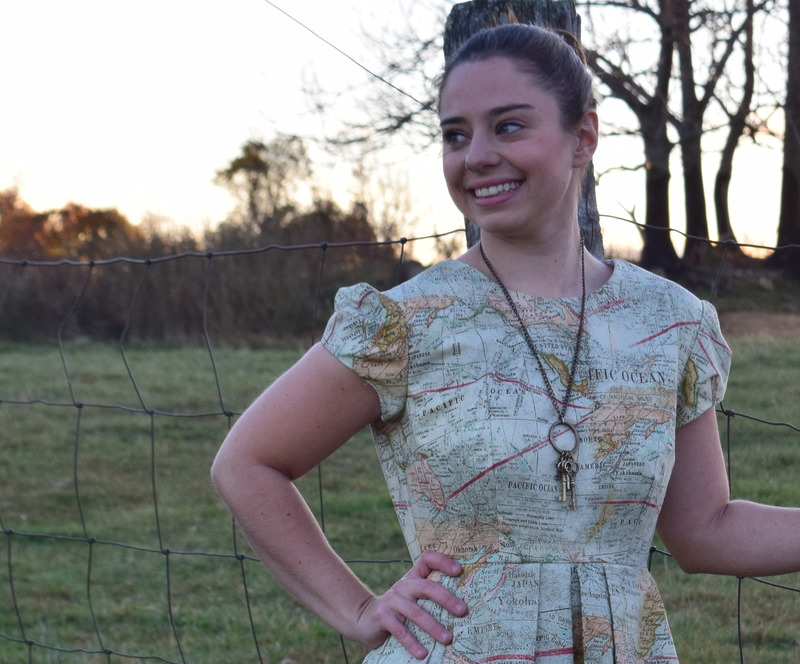 Every so often I would look up map fabric and still nothing caught my attention. 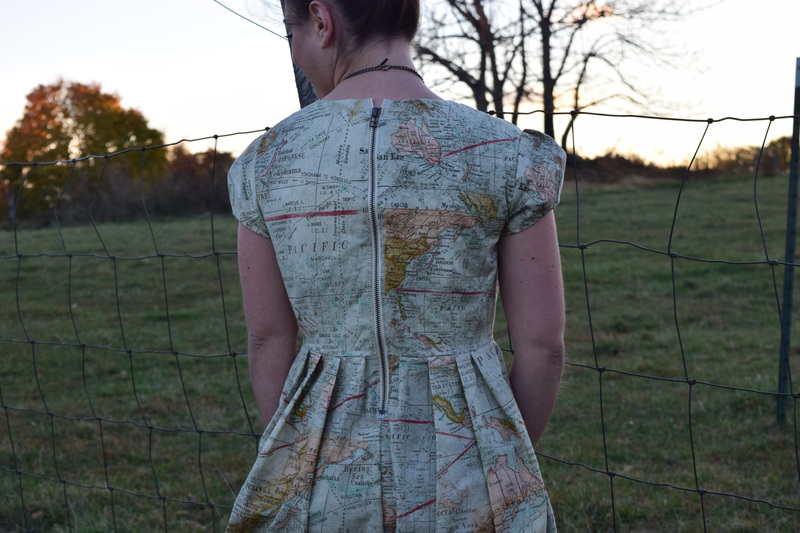 BUT THEN….a project was posted on Kollabora and the maker posted the link to the most amazing map fabric EVER. Life was good and I ordered 2 yards. I had the pattern in mind for the past year, Simplicity’s 1873 by Cynthia Rowley. I’ve made this dress quite a few times and have now perfected the length and fit of it. I had absolutely no intention of making this dress this year, until I found that fabric. I have a jacket, a shirt, my jeans AND my Halloween costume pushed back further on my sewing list because this needed to be made. Not even for a specific event – just because it’s a project that was on my mind for so long. Is that weird? Eh, I never said I was normal. This pattern is one of my favorites. It’s a great style for my body shape and I love the variety of fabrics I can make it in. 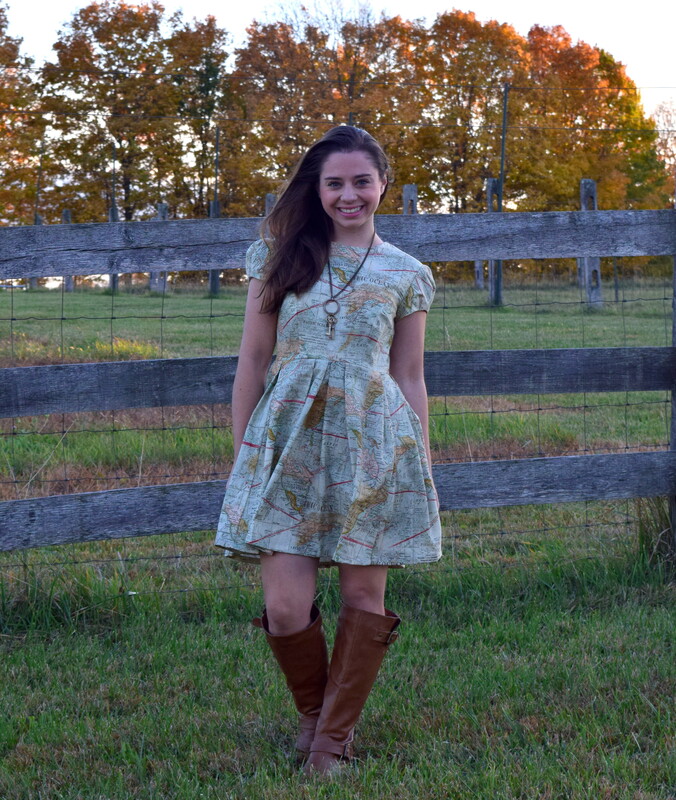 I’ve made this dress for a few occasions: New Years and Thanksgiving. The only change I made to this pattern besides my regular fit alterations was inserting a visible zipper. This pattern does call for an invisible zip but I thought the exposed metal would give the dress a little more rustic look. I do love the result. Don’t mind the back, I was too excited to photograph the dress that I forgot to sew a hook and eye on. 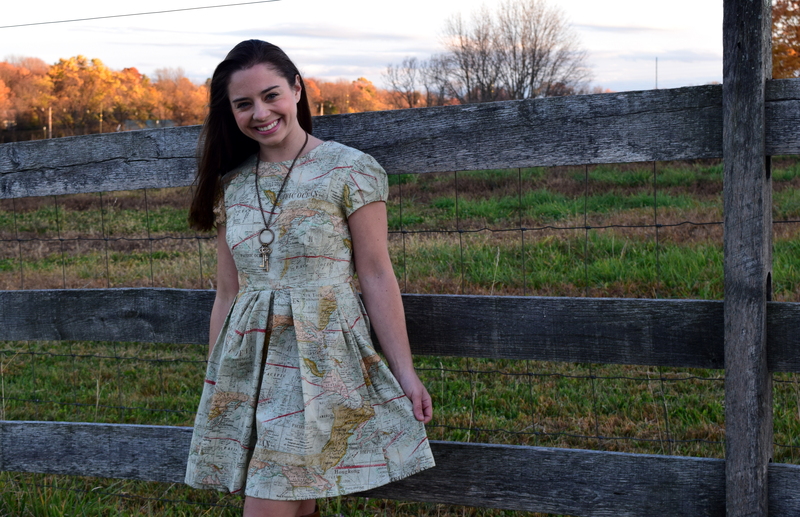 So maybe I’ve inspired you to make your own awesome Map Dress- and if you want to, here’s the fabric! Wanna know the funniest part of this entire thing? 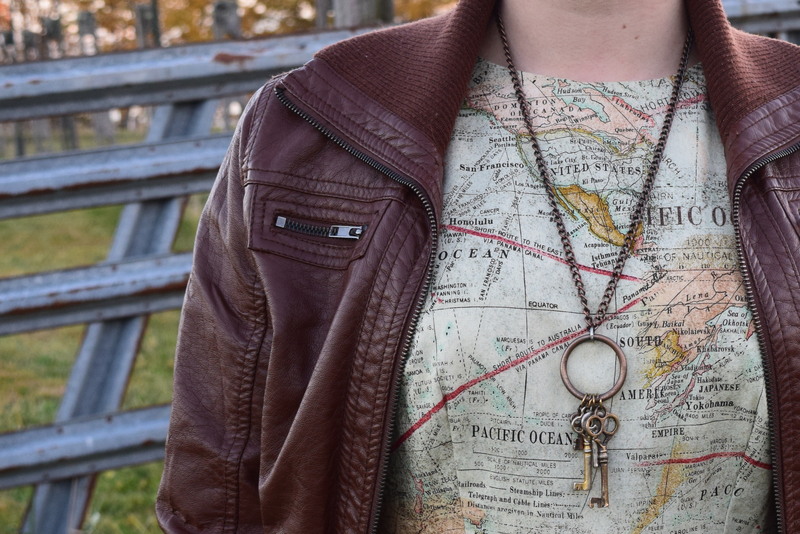 The map print is from the same collection Drew’s watch lining fabric is from! But JoAnn’s didn’t have the entire collection in the store so I didn’t see it! 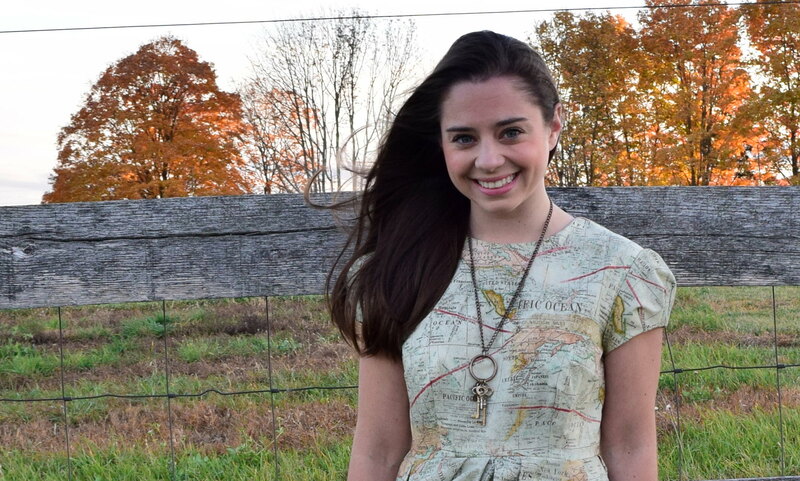 This dress makes me want to go all over the world. But before I do that, I have a lot more sewing to do. AND! I got a new machine! Drew and I celebrated our four year anniversary earlier in the month and he got me my dream machine. It’s the Janome HD 3000. I want to write a review for it after I’ve been sewing with it a little longer. So far it has been smooth sailing but I’m looking forward to putting it to the “layer test”. I’m making some bags this week and I’ll be able to see how it handles layers of vinyl, heavy interfacing and cotton. Previous Post I Made My Own Buttons! Next Post Where I’ve Been. This dress is perfect on you and the fabric is just amazing. I’ve been looking at the other Tim Holz fabrics and they are incredible. They ship to the UK too. Very tempting! Thank you! Yes, I’ve had nothing but good experiences so far with Tim Holz- beautiful fabrics and great, unique prints! Wooo! Third picture down! You are stunning and I love your dress! Thank you so much Kyema! Love the pictures! Thanks for sharing the fabric, I’ll check it out. Lovely dress. Oohh the fabric is so cute! Great choice on the zipper, it’s a nice detail on an already super awesome dress! Thank you Erika! Yes, such a little task that you can easily forget about until editing photos haha! I love that fabric! 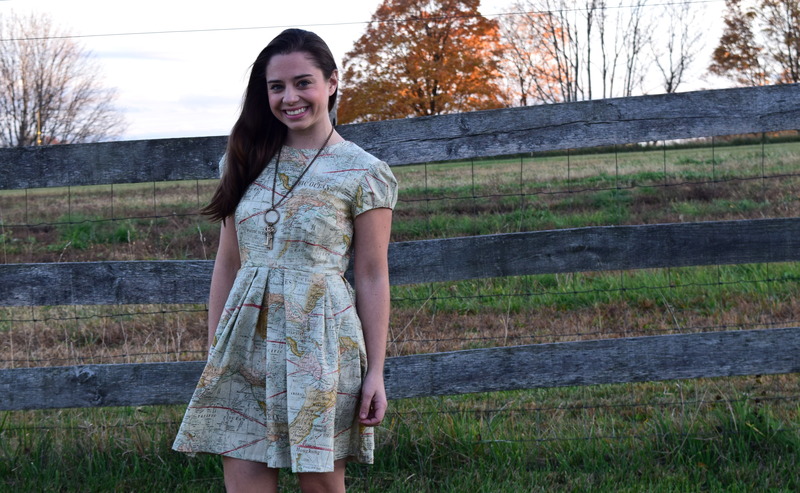 I have a huge obsession with maps and I think the dress looks beautiful on you! Thanks for sharing the fabric.